It’s always amusing to see some folks still using PowerPoint to project song lyrics during worship. I mean it’s such a painfully inefficient way of doing things—especially when there are so many superior and free church presentation software that take just a few clicks to setup and get going. If you want a PowerPoint alternative or simply want to learn more about the best church presentation software available for free to support your worship services, you should read this article. A screen displaying lyrics and Bible texts is more or less replacing printed material at most places of worship. Depending on how it is used, the screen can be a purposeful aid or an unfortunate distraction. Choosing the right church software to run your slides is therefore an important decision to support the worship environment. If you’re on a tight budget, here are a number of free worship software in no particular order that offer a variety of features to suit your church presentation needs. Praisenter is a free Church presentation software to project worship songs, Bible verses and custom slides with images, audio/video etc. If you’re looking for a reliable free option for your worship software requirements, you should take a serious look at Praisenter. Song parts (verse, chorus, bridge etc.) can be tagged easily—in fact, we can add unlimited number of parts to a song! Videos and images can be used as slide backgrounds or as floating components. And yes, videos can be looped! Praisenter can display up to two translations at the same time—great for multilingual services! Praisenter can be installed on Windows, Mac and Linux machines. Praisenter is a beautifully designed, classy church presentation software that’s sure to thrill any worship ministry. One of the most popular open source worship presentation program out there, OpenLP packs a ton of features for managing and displaying songs, Bible verses, images, videos (not video backgrounds though) and more. It facilitates custom alerts, Bible import through CSV files, CCLI/SongSelect integration, PowerPoint file import etc. OpenLP can import songs from a wide variety of sources like Easyslides, Opensong, Videopsalm, Zionworx, DreamBeam, MediaShout etc. Bibles can be imported from OSIS by the CrossWire Bible Society, any CSV file, OpenSong, Zefania etc. OpenLP integrates with one of the most popular open source media player of our times: VLC! OpenLP also has a FREE Android remote app to control the presentation from anywhere inside your church using an Android device—as far as I know, this is a first of its kind app! Built-in stage view accessible from any device with a web browser. Use any device on the local network as your stage monitor, meaning unlimited stage monitors without any extra hardware constraints. OpenLP is a fantastic option for anyone looking for a free and feature-packed church presentation software. If you need a super simple, free and easy worship presentation software, then look no further than OpenSong. It may not have all kinds of bells and whistles when it comes to features, but it does just enough to meet the most important church projection software requirements. OpenSong’s website hosts a wide variety of Bibles that you can download for free and import into your system. You can also present a preset timed loop of defined slides, create custom set lists in just a few minutes, search and find any Bible verse or song in seconds. OpenSong can be installed on Windows, Mac and Linux machines. OpenSong is great for anyone switching from PowerPoint—its simplicity and ease-of-use (I’ve taught people to use it in like 10-15 minutes flat!) make it a standout option! FreeWorship can be used to display worship songs, Bible passages, videos and more. This church worship software supports themes, slide transitions, quick search, import of a variety of lyrics and Bibles etc. FreeWorship is a solid free worship software that should cover most of your church presentation needs. For quick setup, worship songs can be imported many, many sources! FreeWorship can import Zefania and OpenSong Bibles, which should take care of most of your scripture projection needs. Like OpenLP, FreeWorship also integrates with VLC for video playback—so any file format supported by VLC can be run here! The presentation slides can also be spanned across multiple projectors. There’s a really cool auto verse feature, using which FreeWorship finds a related Bible verse when you search for a song! FreeWorship is feature-rich, provides terrific import options and flexible enough to fulfill even demanding church presentation needs—this is a keeper! EasiSlides is a free worship song projection software designed for projecting lyrics and Bible texts—basically, it’s designed for church worship. With over 80,000 downloads and counting, EasySlides is a very popular option for anyone looking for free church presentation software. There’s another third party transfer tool to work on one machine and then migrate the presentation including the underlying files to the church computer that will be used for the actual projection. EasySlides is an actively developed software with a huge user base—its ample set of features is sure to satisfy worship teams and Church tech enthusiasts. Quelea is an open source church projection software with a nice set of features to serve your church presentation needs. In terms of importing existing worship songs from other software, Quelea stands tall with the best of them. Worship songs can be imported from just about anywhere—OpenSong, OpenLP, ZionWorx, Sunday Plus, Kingsway Online, EasyWorship, EasySlides and more. By supporting Zefania XML Bible formats, Quelea gives us access to import and use a vast list of Bible translations. So getting your favorite Bible translation into Quelea shouldn’t be too much of a hassle. Quelea helps with the church projection setup providing many test patterns you can use to ensure the screen is calibrated and positioned correctly. Quelea can push song lyrics to any mobile device with a browser—in real time—and you can choose the display colors to best suit your viewing needs. It also supports a separate stage view, enabling display of worship song chords only to the band onstage. Quelea is Windows only at the moment. Quelea is a superb church presentation program with a remarkable set of functionalities that should delight any Church. If you need a worship software option with all kinds of features rivaling even paid alternatives, then VideoPsalm would be your No. 1 choice. Of all the church presentation software I’ve had the pleasure to try out, VideoPsalm is the most exceptional—you’ll find just about any and every feature you might need! Is it an easy worship software? Maybe not, but once you spend some time to learn it, there’s no looking back—you’ll love it. Like Quelea, VideoPsalm can import songbooks from several sources—EasySlides, EasyWorship 2009, MediaShout, OpenLP, OpenLyrics format, OpenSong (Chords get imported too), Psalmo and plain text. Moreover, the VideoPsalm online library itself provides over 10,000 worship songs! Songs can also be stored with chords in ABC or Do-Ré-Mi notation apart from ChordPro compatibility. Just like OpenSong, there’s a useful transpose feature here too. How does 330+ Bible translations in 100+ languages sound? Yes, that’s the number available! Apart from all the regular Bible verse display features, VideoPsalm also supports dual language verse projection. VideoPsalm displays video, audio, photo, countdown, alert, PPT files and more. It’s a truly all-in-one worship software that can manage whatever you throw at it. Slides can also be edited on-the-fly right in the middle of a presentation. Media files can also be found quickly with the built-in search function. The slide setup features are vast and comprehensive. VideoPsalm provides granular control of every aspect of your slides and templates. Fonts, backgrounds, media, colors etc.—all of it is easily customizable and editable. Even during a live presentation, background image/video can be changed on-the-fly. VideoPsalm is Windows only at the moment. At the price of free, VideoPsalm—with its massive feature-set—is a splendid option for your church presentation requirements. I doubt you’ll find a better option than this. Datasoul is an open source church presentation software to display lyrics, scripture and other text in worship services. It has a flexible template system to preset how the slide content is formatted. It can be used to present slides with image and video backgrounds (including live feeds from an attached video camera). Alerts, support for any display resolution, launch of other files like PPT, Open Office, remote display over network etc. are other useful features of Datasoul. Presentations can also be exported as PDF files. Songview is a free worship song projection software for churches that can handle projection of songs and Bible passages with image or video backgrounds. Songview supports PowerPoint files, addition of guitar chords to songs with stage display for bands, alerts, slide editing during live presentation and more. Similar to VideoPsalm, Songview can also be installed and run from a USB drive also. 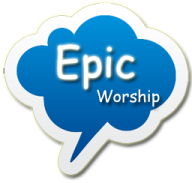 EpicWorship is a free, open source church projection and presentation software focusing on simplicity. It comes with just the most important list of features without complicating anything. EpicWorship facilitates slide projection with image and video backgrounds (MP4 H.264-encoded only), import of OpenSong Bible formats and playback of audio files (MP3 or AAC). Like OpenSong, it’s simple and easy to install and use. LyricsPro is an Android church presentation app. Using a schedule interface, LyricsPro can be used to present lyrics, videos, images and PPT slides. Font formatting and setting up image and video backgrounds are also possible. Songs can be imported from SongSelect too. This can be best used in small group worship or band rehearsal sessions I think. I will be watching this project to see how it develops in future. Praise Base Presenter is an open source church presentation software to project worship lyrics, photos (JPG only) and Bible passages. Apart from a simple song editor, it can also import Zefania XML Bibles and display lyrics in two languages. If the above options have not been able to convince you to ditch PowerPoint, then you should consider using Church Presenter. This is a free plugin for PowerPoint 2007 that adds quite a bit of church friendly muscle to PowerPoint. The add-in enables using PowerPoint for presentation, while facilitating quick song search by number, theme, alphabetical index, and keyword. The layout of lyrics and Bible verses can be customized by using editable templates. Also supports export of songs to regular PowerPoint files with embedded fonts. Windows only. Have I missed anything in this list? What is your favorite worship presentation software? Do share in the comments. Experiments in Giving Our Congregations Opportunities to Respond	111 Praise and Worship Quotes to Inspire & Bless You! A chart summarising & comparing these would add a great deal of value to the article. Good suggestion Peter, will try to get it done. Disclaimer: I am a developer for Big Screen. Big Screen is not free Marc. Do you have a recommendation for church presentation software that time sync with a project wireless-ly? You could try cloud based solutions like Proclaim or Worship Extreme. Choose your software, visit its website and go to the ‘downloads’ page. Does any of these app allows to use a remote presenter? Or we need to have someone to sit next to the computer to click? We are looking for a program that you do not need an internet connection to use. Can you help us out? Almost all of these programs don’t need an Internet connection to work. I still fall back to PowerPoint. I have tried various other products, and while they can do some creative and different things, they all seem to be unable to do some essential thing. One of my main gripes is that many of them cannot do the simple task of displaying a verse with a section of it in a different color for emphasis. In the end, it is just easier and quicker to create my songs and sermon verses in PowerPoint. No CCLI plugin, but I have many songs already created and ready to go anyway. Why reinvent the wheel? Just thought I’d point out that VideoPsalm can do this. Once you select your Verse(s) and add them to your agenda, you can right click them to convert them into an editable format in which you can do colors, fonts, and all kinds of things. Exactly what I need too. People don’t want to see the bible verse by verse, a highlighted verse is way better. VideoPsalm is an awesome piece of software. As a fledgling church, we were looking for presentation software that was free since we had no budget. I tried a few different ones but ended up with VideoPsalm. There is a learning curve to get started but once you get the hang of it, it’s incredibly easy to use. I can’t think of a feature I’ve needed that it couldn’t do. Video background, song imports, multiple import formats (PPT, PDF, etc), and more. Support is also great. I’ve emailed the author a few times and always get a prompt response. If you’re looking for church presentation software, even if you have a huge budget, check out VideoPsalm and you’ll love it. Is this video mapping software that will allow you to project custom animation? If you choose a video compatible software, you can project just about any video file.